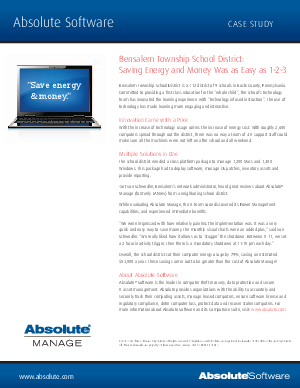 Bensalem Township School District is a K-12 district of 9 schools in Bucks County, Pennsylvania. Committed to providing a first class education for the "whole child", the school's technology team has innovated the learning experience with "technology infused instruction". The use of technology has made learning more engaging and interactive. But with the increase of technology usage comes the increase in energy cost.